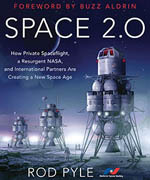 Las Cruces, New Mexico – October 17, 2012 – The National Space Society (NSS) and the New Mexico Museum of Space History (NMMSH) announced a new partnership on Wednesday for the establishment of a permanent home for historic records chronicling the development of the space activist community and the U.S. space industry. 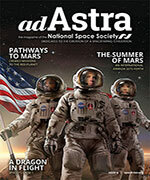 This alliance is the result of four years of discussions and negotiations about the disposition of the Society’s archives (which go back as far as the mid-1970’s when Wernher von Braun founded the National Space Institute, a predecessor of NSS) and will officially enable the Museum to begin accepting materials from the Society. 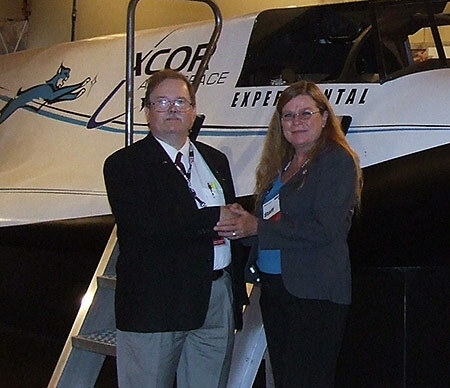 Image: Dale Amon, NSS Archivist, and Kathy Harper, NMMSH Marketing & Public Relations in front of the Lynx I Spaceplane mock-up at the 2012 International Symposium for Personal and Commercial Spaceflight conference in Las Cruces. Click image for larger version (2500 pixels). Amon and Orwoll also expressed their appreciation to ISPCS organizer Pat Hynes for her foresight in creating an event that fosters communication between different organizations and promotes partnerships throughout the space community. New Mexico’s Spaceport America, the first commercial spaceport in history, is a major outcome of decades of work by space advocates at NSS and other like-minded citizens. The Museum project will not only detail that past effort, but document and preserve the evolution of space travel in the exciting years to come. About the New Mexico Museum of Space History: The NMMSH is charged with collecting, researching, and preserving objects (artifacts and specimens) and documents related to its mission which is, in part, to educate its visitors from around the world, in the history, science, and technology of space. The museum’s Collections Management Program ensures proper accountability of the objects entrusted to its care, for the sake of posterity, and for the benefit of its constituents and clientele. This is accomplished through sound documentation; meticulous record keeping; collections-oriented research; artifact preservation/conservation; and strict compliance with the NMMSH Collections Management Plan policies/procedures and American Association of Museums (AAM) standards and guidelines. Located in Alamogordo, New Mexico, at the base of the Sacramento Mountains, the Museum is a tribute to the brave men and women who for centuries strove to conquer space. The Museum is a division of the New Mexico Department of Cultural Affairs.